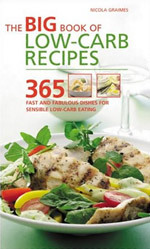 365 recipes including sections on breakfasts, desserts and baking. 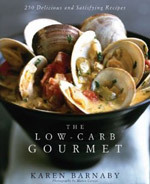 Nicola Graimes is an experienced cookery editor and an author of 12 cookery books. 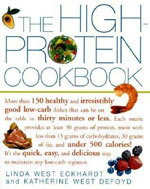 Tips on low-carb living, cooking and shopping; inspiration for entertaining and family meals; plus over 80 easy-to-prepare recipes. Karen Barnaby is executive chef at the award-winning Fish House restaurant in Vancouver, Canada. She herself has lost and kept off more than 5 stone through low-carb eating. This book features 1001 recipes, covering everything from breakfast to snacks, dinner-parties to lunch-boxes, and desserts to picnics. 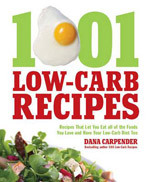 Dana Carpender is author of nine cookbooks. Dropping carbs long before it was fashionable, Carpender lost 40 pounds following a low-carb lifestyle. Drs. 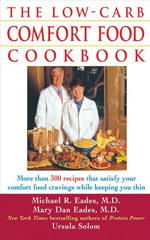 Michael and Mary Dan Eades and chef Ursula Solom give you unique, easy cooking tips and more than 300 low–carb recipes for foods that help you keep your weight down and fulfill your cravings. Drawing on their experiences as award-winning cookbook authors, Linda West Eckhardt and Katherine West DeFoyd have developed a range of high-protein meals that are quick enough to make on a weeknight but elegant enough to share with guests. 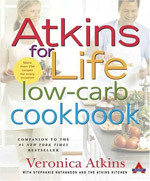 A companion to the best-selling Atkins for Life features more than 250 new recipes pertaining to the “Pre-Maintenance” and “Lifetime Maintenance” segments of the Atkins low-carb program, in a collection that provides for special occasions, daily meals, and entertaining. 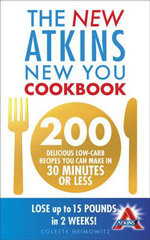 200 delicious Atkins-friendly recipes for making Atkins-friendly breakfasts, lunches, dinners and desserts. Although low-carb, they are not carb free, which means you can indulge in delicious muffins, tasty Paninis and flavorsome pizzas – and still lose weight.